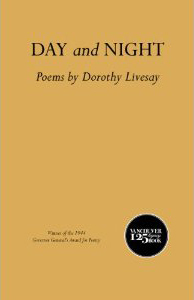 Day and Night was awarded the Governor General’s Award for Poetry in 1944 and established Dorothy Livesay as a writer. More than 60 years have passed since then and I wondered why the publishing company made the decision to print an anniversary edition. Upon reading the poems however, I realized that Livesay’s poetry is still relevant, particularly in light of present-day political unrest and economic uncertainty. Her poems concern themselves with the human penchant always to want more and the consequences of that greed, with wars and the unpredictability of weather. There is no milk nor honey flowing there. and learns the only way to combat the injustices is to protest, to strike. Fernie, BC: Oolichan Books, 2011, ISBN 978-0-88982-281-8, 67 pp., $19.95 paper.